The concept of farm to table has been taken a step further with cutting-edge, hard-working entrepreneurs like the folks at Outstanding In The Field by taking the table out of the restaurant and placing it at a local farm. Regular people get a chance to explore growing first hand and then enjoy the farm goods as cooked by a local chef. It’s fresh, upscale, informative and super delicious. 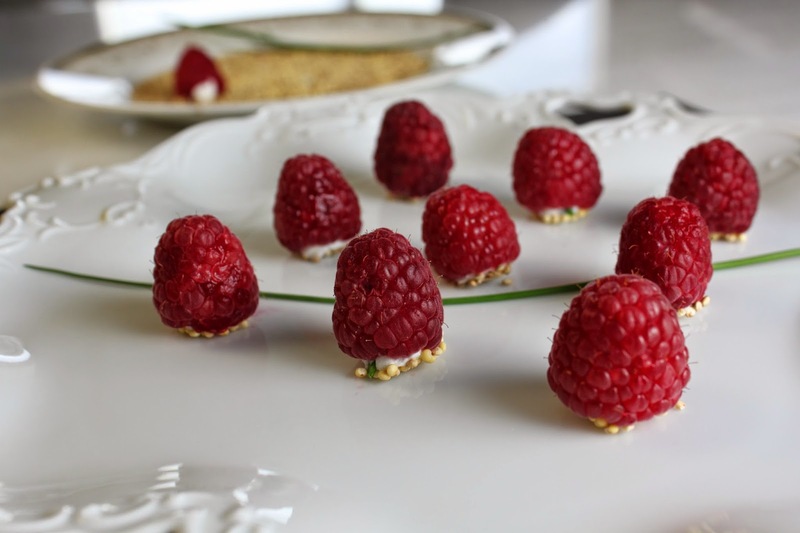 We attended one of these dinners last year in South Haven, Michigan, where we first encountered these delightful raspberry nibbles. Creamy goat cheese and sharp chives cradled in a bright berry, nestled on top of a finishing crunch. A perfect bite. Mine are slightly different from what I remember. They used a puffed rice for the crunch, while I used a popped quinoa. They may have used different herbs in the filling. I happened to have fresh chives and love the little onion hit with the berries. All in all, it’s a gorgeous little presentation and is fairly simple to put together. Try these super tantalizing appetizers for your next outdoor party. Then, I highly recommend visiting your local farm to see what inspires you. I’m personally psyched for our farm dinner this year in Door County; good food and good friends abound. Pop the quinoa: heat a dry skillet over medium high heat and add the dry quinoa. The quinoa will “pop” and become toasty brown. Keep an eye on them as this will happen quickly. Shake the pan often (think of making popcorn). Remove from heat and set aside. Rinse the berries and set aside to dry. Snip the chives into the goat cheese. Add the lemon juice and mix. I find it easiest to do this just using a fork and sort of mashing it all together. Put the chive goat cheese into a small zip lock bag, snip off a small corner of the bag (think about the size of the berry hole. You don’t want the hole too big). Now fill the berries with the goat cheese. Just squeeze the bag of cheese into the berry. 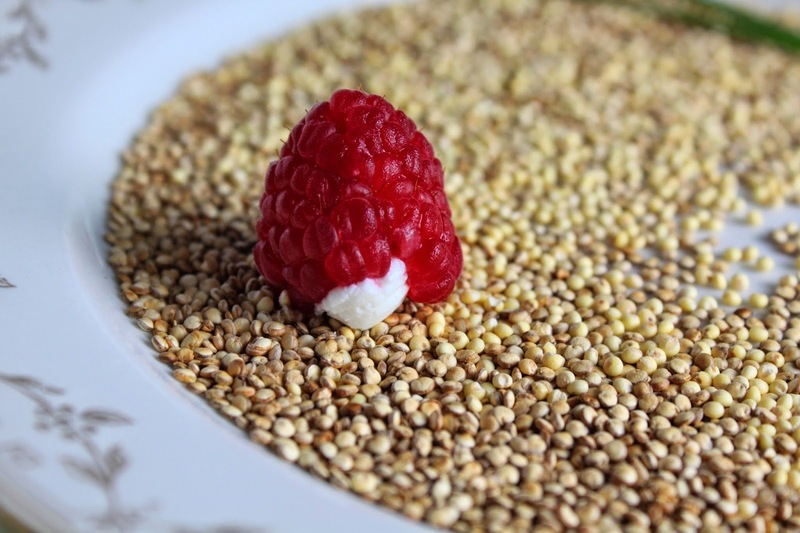 Tap the filled-cheese side of the berry onto the popped quinoa. 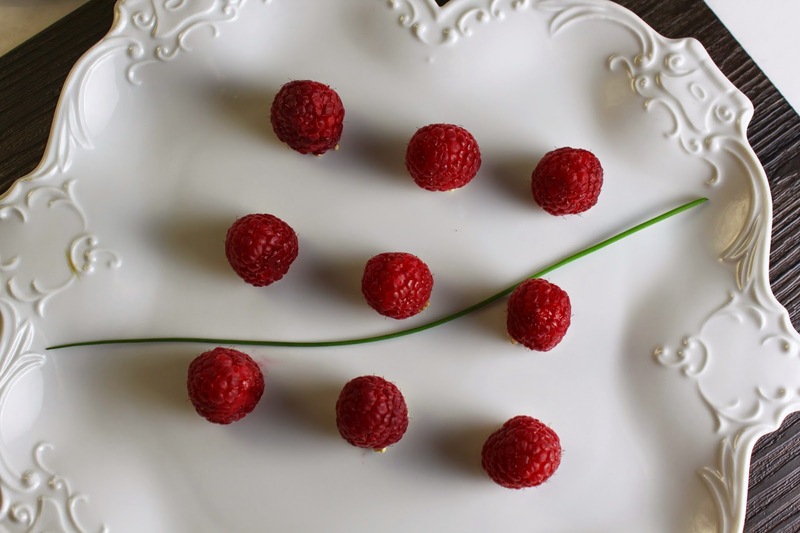 Set the berries on a pretty platter and serve. Fat and Happy Tips and Techniques: Cutting chives with a knife is almost impossible. Use a scissors and “snip” the chives instead. For more recipes, go to Monique’s blog: fatandhappyblog.com and Monique’s new site, happyeatshealthy.com.